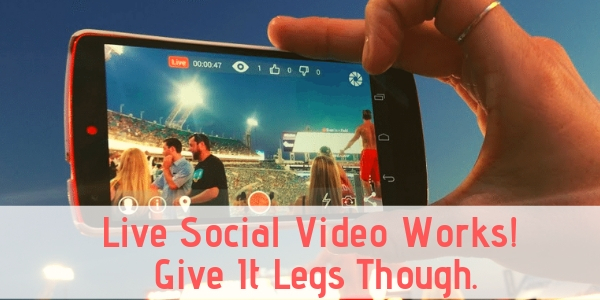 It’s not just video that is exploding on the social web these days. It’s the ability to live broadcast. Today, every major social network including Facebook, YouTube and Instagram make it very easy to instantly go live and broadcast in real time. But how to give your live video “legs” or more life after the live stream ended? While most people get alerts when a user they follow goes live, not everyone is able to see this unique content when it is actually happening. With taking your live videos and providing the ability to be seen on-demand opens your videos up to be seen by a much bigger audience when they have the ability to watch. On Facebook, before you hit the live button, you have the ability to choose where the video should be posted once the live stream ends. You can post it on your timeline, a group you are in and even embed the code on your website and blog. With Instagram you can create your live video as a story and then save it as a Story Archive. This way people can view it beyond the 24 hours regular stories live. You can also take your live video and turn it into a Story Highlight, which sits in prime “real estate” on your Instagram page. YouTube Live makes things very easy. Live videos created in there automatically upload to your channel for future watching. Live video creators need to be aware that live videos can be long in nature when originally filmed but for the most part most viewers don’t stay and watch the entire video. That means before posting your on-demand version of the video, you may want to utilize software and cut the video down into segments or chapters so people can watch in much smaller time frames. What makes live video so great is that it’s truly authentic and genuine. Viewers that watch live video understand accept that these videos will more than likely include mistakes, errors and unscripted types of content. They know that the content may not be in high, professional quality and not heavily edited. That translates into content that is truly real and relatable for consumers and fans to comprehend. So whether live or on-demand, your social media strategy should for sure include live video filming. It will only benefit you and show the human side to your business or brand. For a live social video strategy contact The Interactive Imprint today at 954-254-1650 or visit TheInteractiveImprint.com.